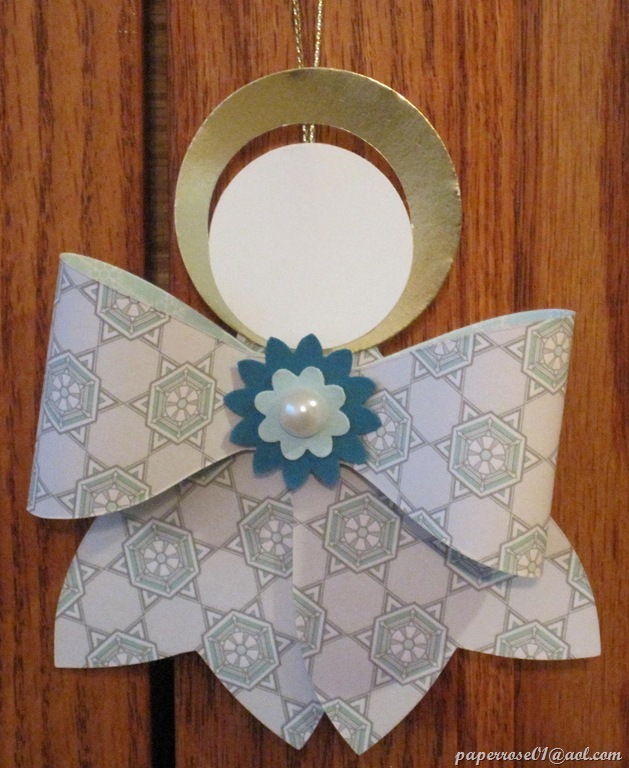 I think these angels are just so cute and so simple to make. 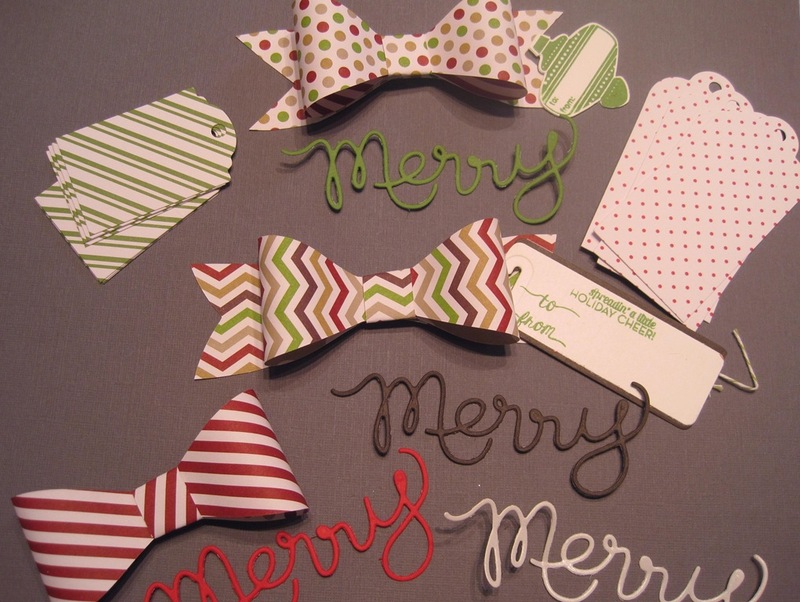 Of course they can be used anytime during the year, but I think they are perfect for this festive time of year. I have these hanging on my kitchen cabinets and they really add to the ambience. Note how these two angels have their “wings” to the front. These two angels have their “wings” to the back. The blue angels were made from the Winter Frost DSP and are lighter weight than the red angels. I used Real Red CS for the red angels and stamped them prior to putting them together. Not sure how these will show up on the blog as when I try to adjust picture placement, the blog ends up a bit off kilter – but we will give it a try. I’ve used different decorations at the neck of each angel. 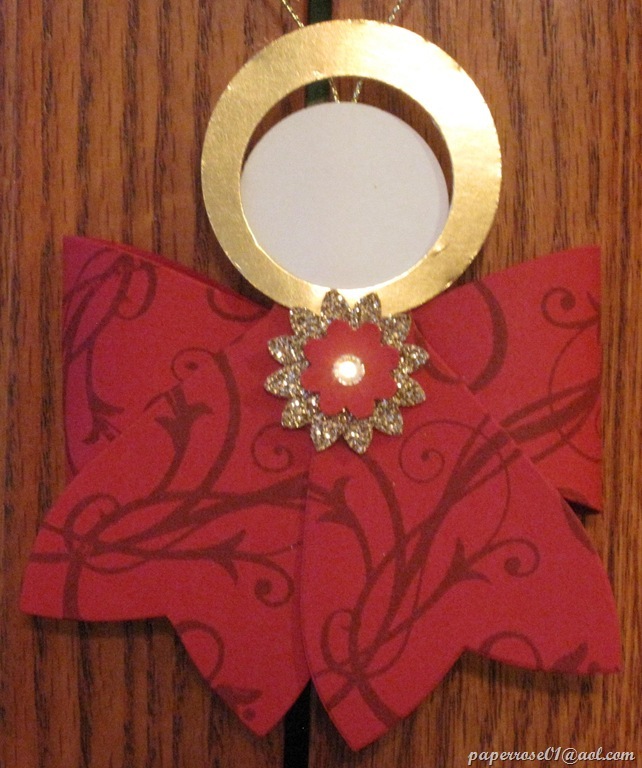 I’m going to try a silver halo on several angels so that I can use a Frosted Finish embellishment . I didn’t care for the gold/silver contrast on the angels with the gold halos. 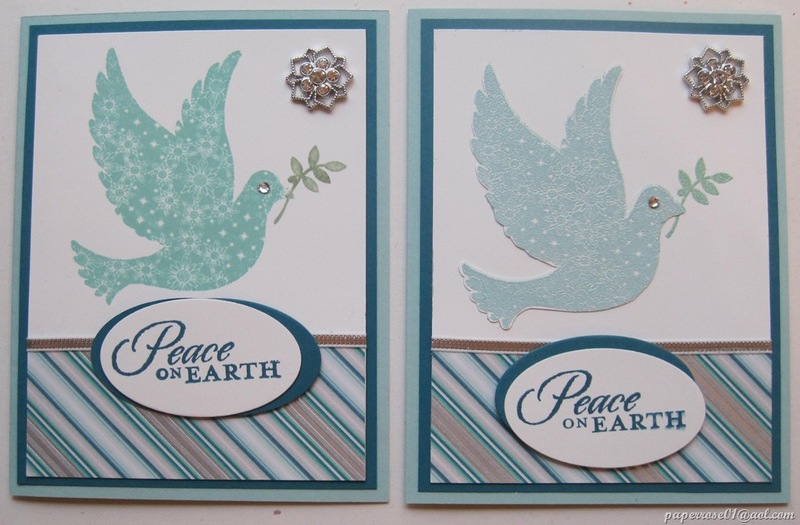 For December Stamp Camp, I will be demonstrating these simple angels and will send you home with a template so you can make your own in any color – any card stock. You can mix and match and create your heart away! Remember the dates for this upcoming Stamp Camp: Saturday, November 30th starting at 9 AM (but you must let me know if you will be attending on this date), Thursday, December 5th from 2 to 9 PM, Friday, December 6th from 2 to 9 PM, and Saturday December 14th from 9 AM to 4 PM. Please note that I will be out of town on Saturday, December 7th. Please let me know if we need to arrange an alternate date/time for you. I could easily do mornings on December 5th and 6th if that would be helpful for you. We do not have Stamp Camp in January, but will meet in February on the 6th, 7th and 8th. 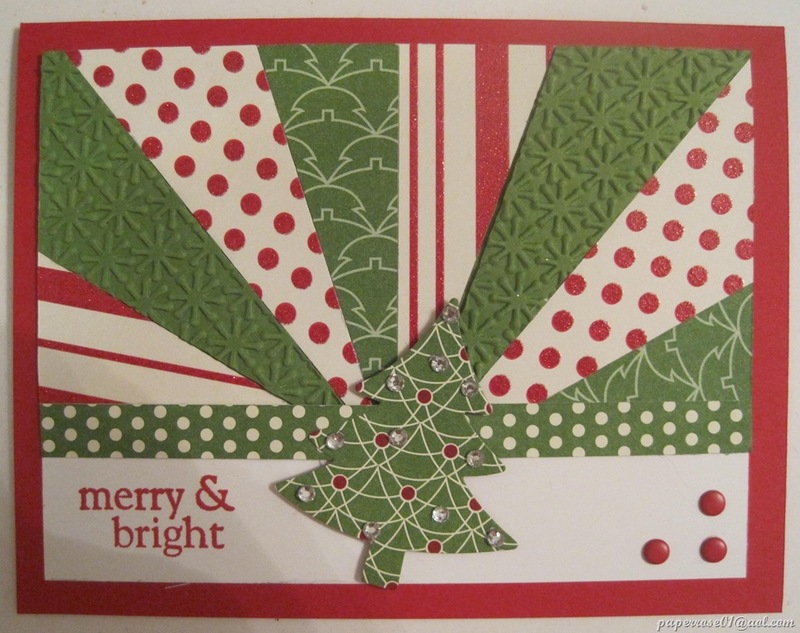 I will keep you posted on Stampin’ Up sales you might be interested in. A new mini catalog will be coming out in December. I’ve seen the preview copy and there are some nice items shown. You should be receiving yours in the mail; please let me know if you don’t receive it by the end of December 2013. 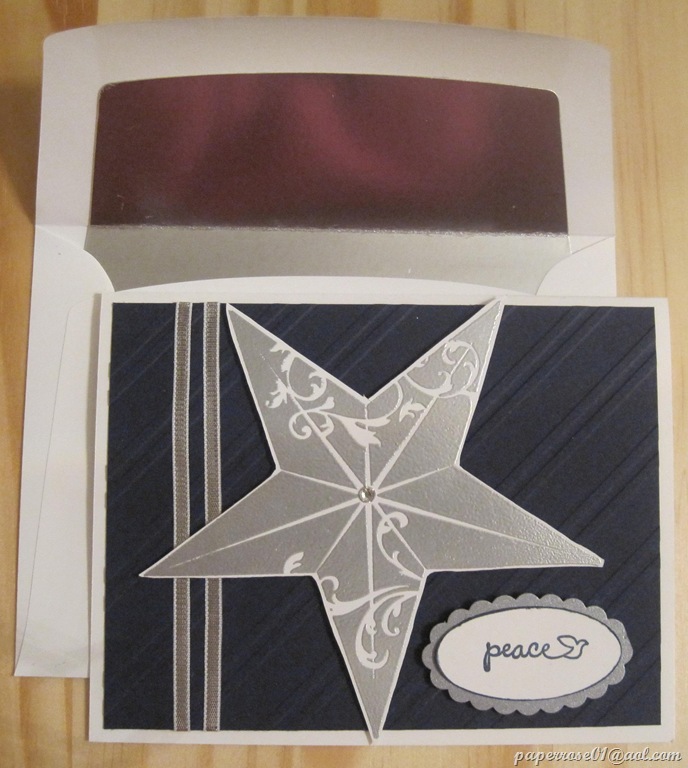 Although this card is very similar to the Christmas Star, Deb and I felt it was so elegant in Navy with the Stylish Stripes Embossing Folder and the 1/8” Silver Ribbon. Although we have Navy cs cut for you, if you prefer Cherry Cobbler or another color, please let us know. 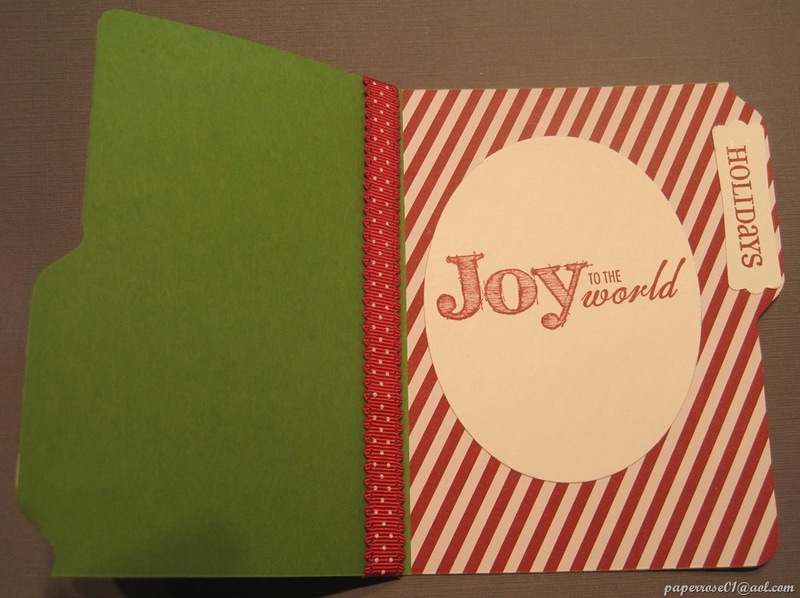 The “Wonderful Blessing” image was stamped in Versa Mark and embossed in Silver. 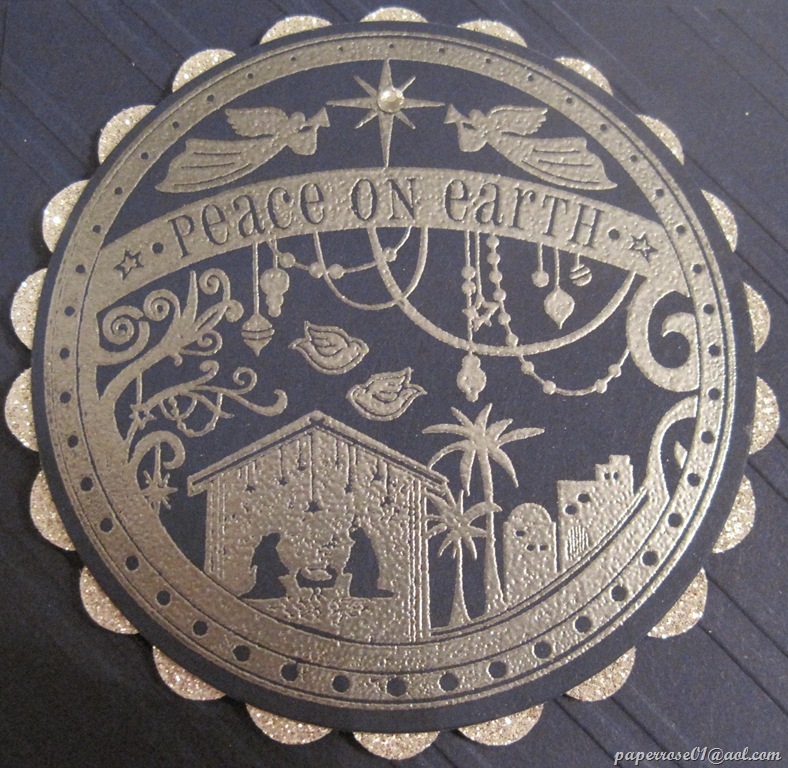 A die cut Silver Glimmer scalloped circle surrounds this beautiful scene with a small rhinestone glistening in the center of the star. 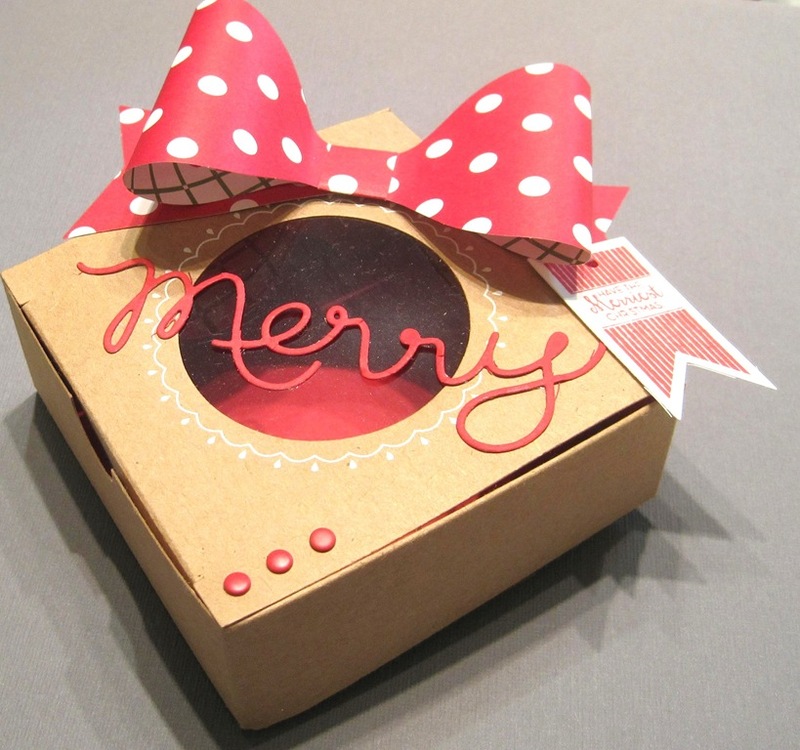 The double silver ribbon is highlighted with a Frosted Finishes embellishment. 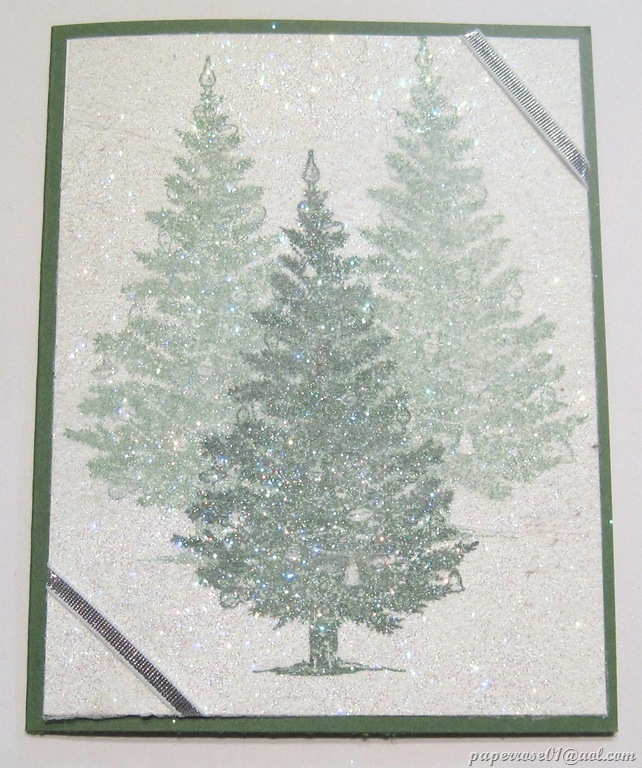 Note the silver foil-lined envelope which is the finishing touch to this beautiful card. A close up of the stamped image is below. 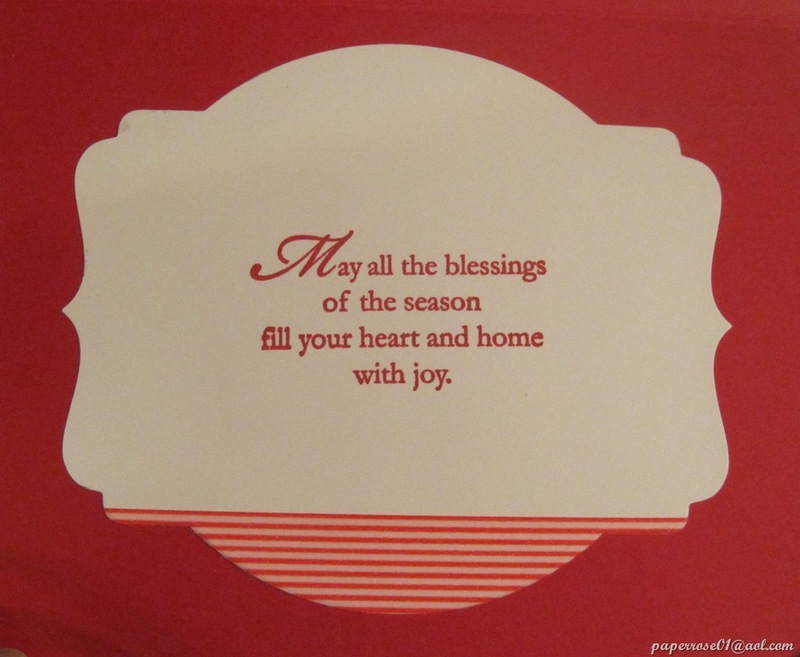 This is the inner part of our Wonderful Blessing card. There is a thin strip of silver glimmer cs adhered to the top of the white cs. I also stamped a silver star image and stamped my message in Night of Navy. The bottom edge of my cs is finished with a retired border punch which allows the navy to peek thru. 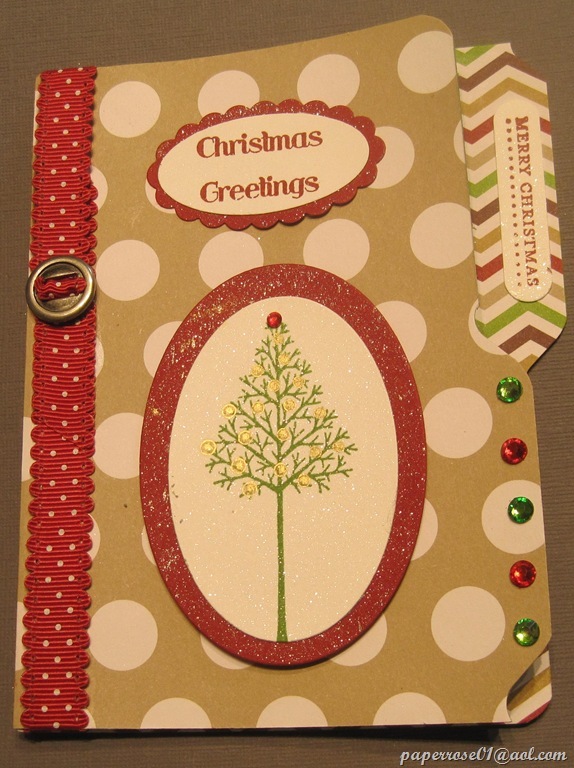 This is the third of the three cards we will be creating for our December Stamp Camp. I will be putting out one additional post to show the angels I will be demonstrating. 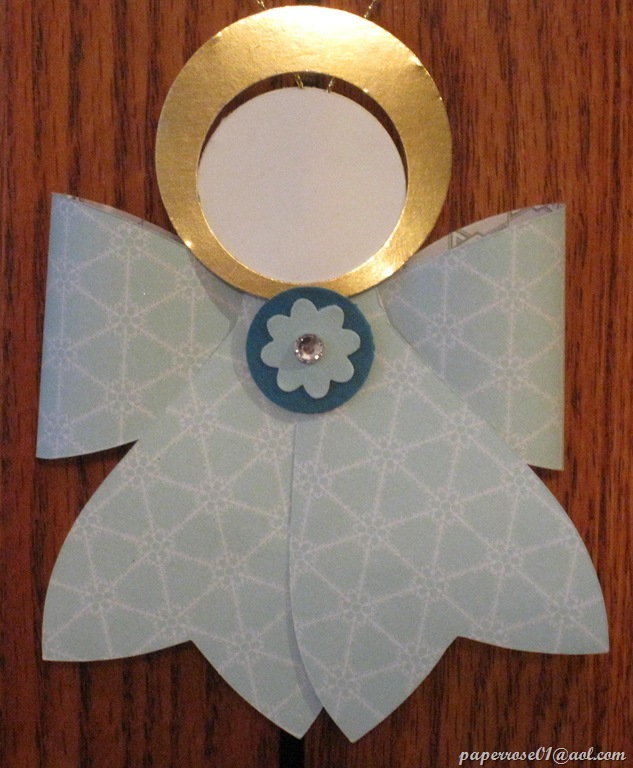 As I mentioned before, I will be demonstrating the simple steps to make these angels and will send everyone home with a template so that you can make your own. 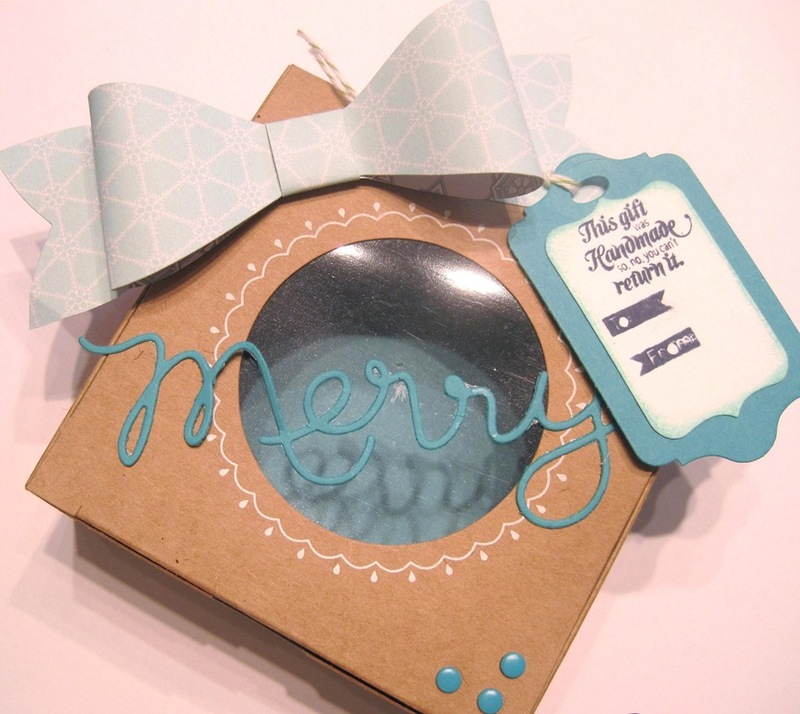 These make cute little ornaments, stocking stuffers, and simple gifts. Stamp Camp for December will be held on Saturday, November 30th starting at 9 AM (but you must let me know if you will be attending on this date), Thursday, December 5th from 2 to 9 PM, Friday, December 6th from 2 to 9 PM, and Saturday December 14th from 9 AM to 4 PM. Please note that I will be out of town on Saturday, December 7th. Please let me know if we need to arrange an alternate date/time for you. I could do mornings on December 5th and 6th if that would be helpful for you. This starburst card features DSP from the past as well as a bit of Real Red cs. 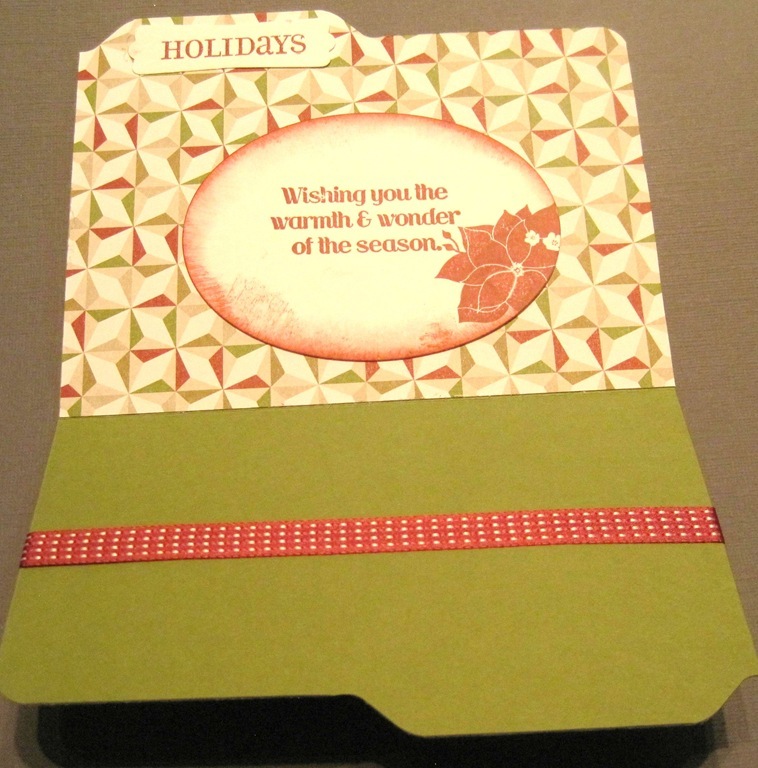 The red cs was embossed with the fancy fan embossing folder to add a bit of texture. 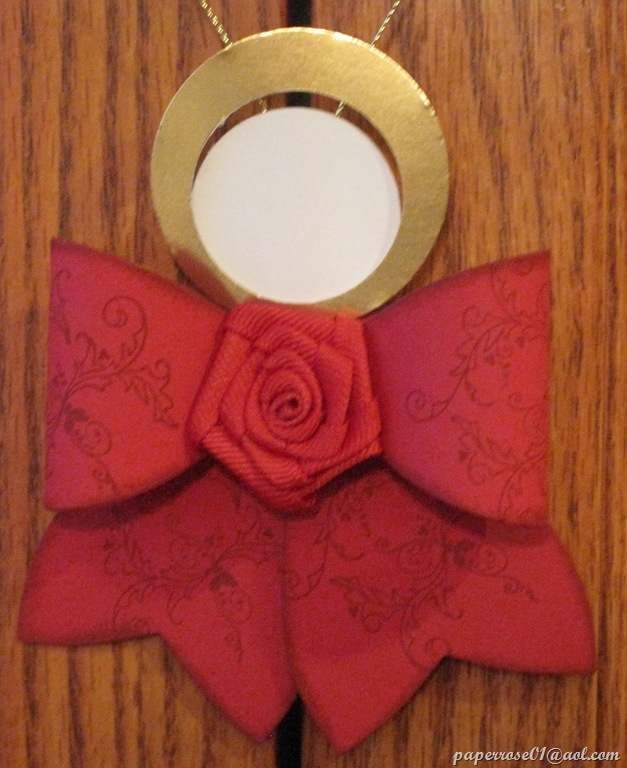 We used narrow red grosgrain ribbon to “ground” the starburst design and finished it off with a bit of bling and a greeting. 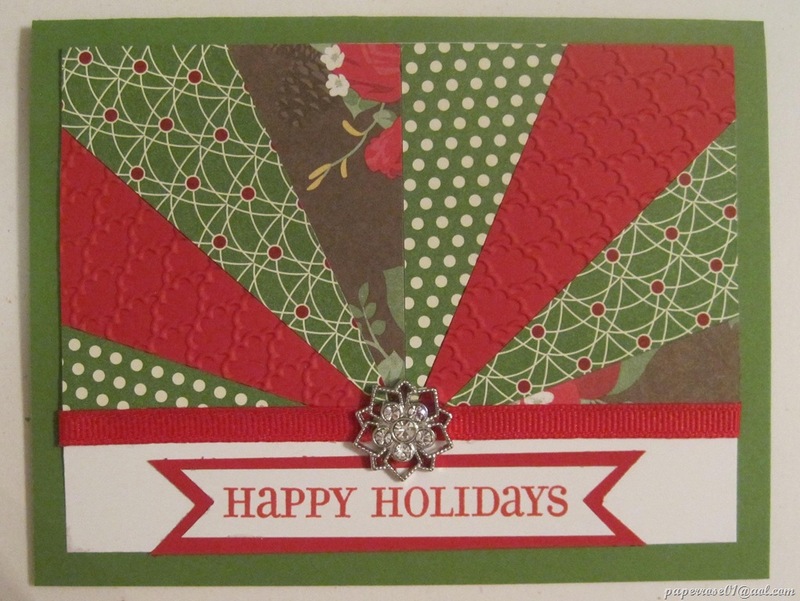 Christmas DSP from the past is featured here as well as Gumball Green cs that was embossed with the retired snowflake embossing folder. A thin strip of DSP “grounds” the design and a DSP tree adds bling and interest. Notice the offset greeting and the use of candy dots. 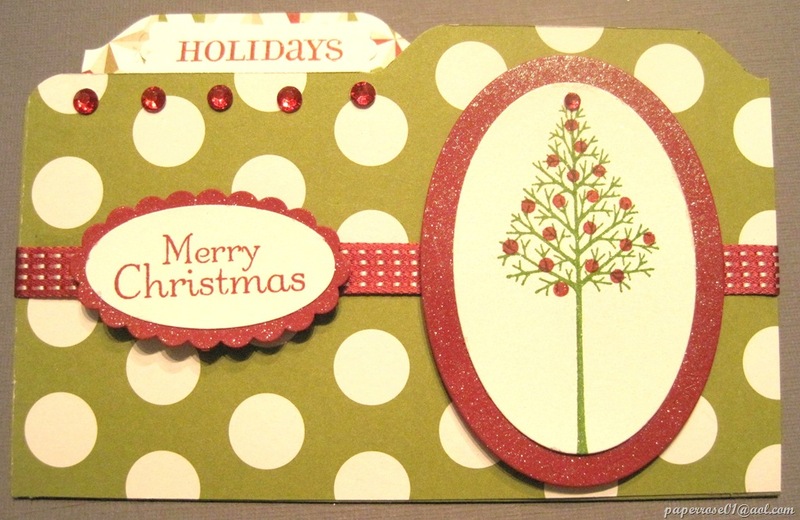 The card features washi tape in the starburst design, at the bottom of the card, and on the inner message. I added 2 strips of the red/white stripe washi tape to some card stock, cut out a 1 1/2 C 4” strip and cut it again diagonally. 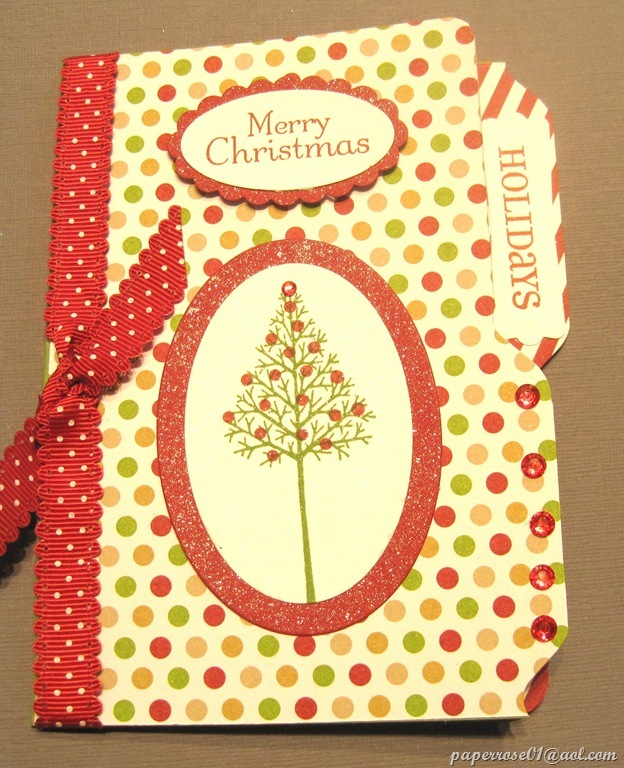 I also used a bit of red glimmer paper for pizzazz. 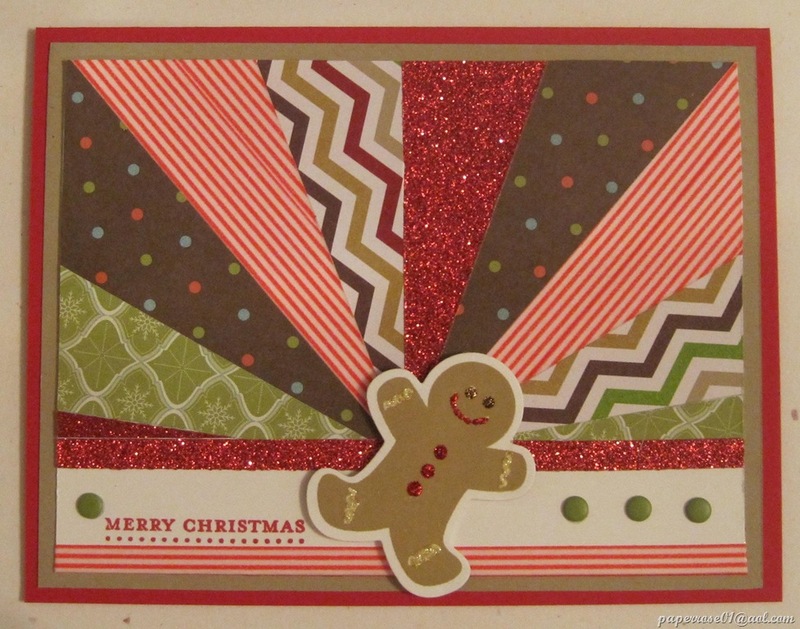 The gingerbread man was stamped, die cut and decorated with Stickles. This is the inner message for the washi tape card above. Note the washi tape at the bottom of the deco label. Repeating the process I used previously, I added a strip of washi tape to my white cs and insured that the thinlit die had exact placement before I ran it thru the Big Shot. Using the magnetic platform makes the task much easier. The result is washi tape that is evenly distributed on both sides of the die-cut deco label card stock. These cards are really fun to do, and you can be as creative as you want! For the December Stamp Camp, we will have 3 sets of pre-cut DSP/cs you can choose from, or you can choose your own from the available DSP and cs. I will assist with cutting the cs if you wish. Emboss using any folders from my ever-growing embossing folder collection if you choose. Just have fun! As a reminder, I will be out of town on Saturday, December 7th so the Saturday Stamp Camp will be held on “Black Saturday” – November 30th – and on Saturday, December 14th. The Thursday and Friday dates December 5th and 6th starting at 2 PM. If these times do not work for you, please contact me and we will work out an alternate date/time. Please note that if you are coming on November 30th, please please please, let me know, as the number of people attending will affect how we set up seating. 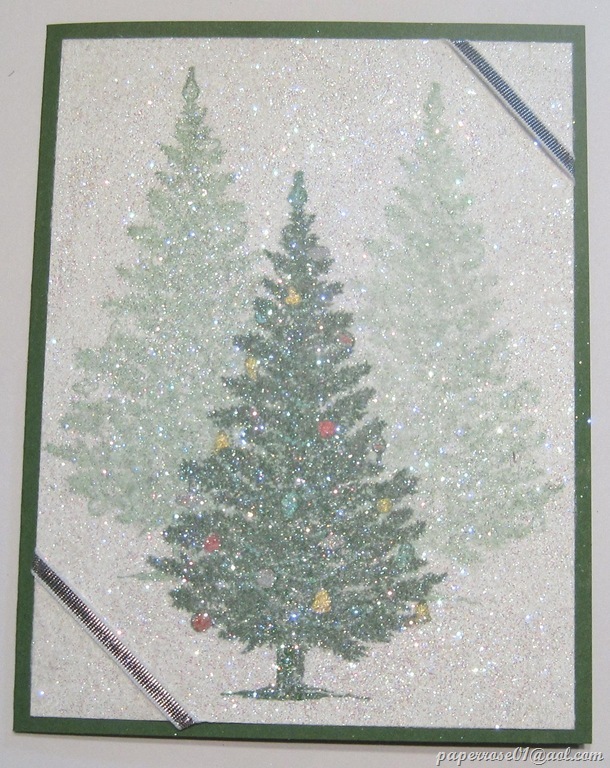 Isn’t this an absolutely beautiful Christmas card? So striking, yet so simple. 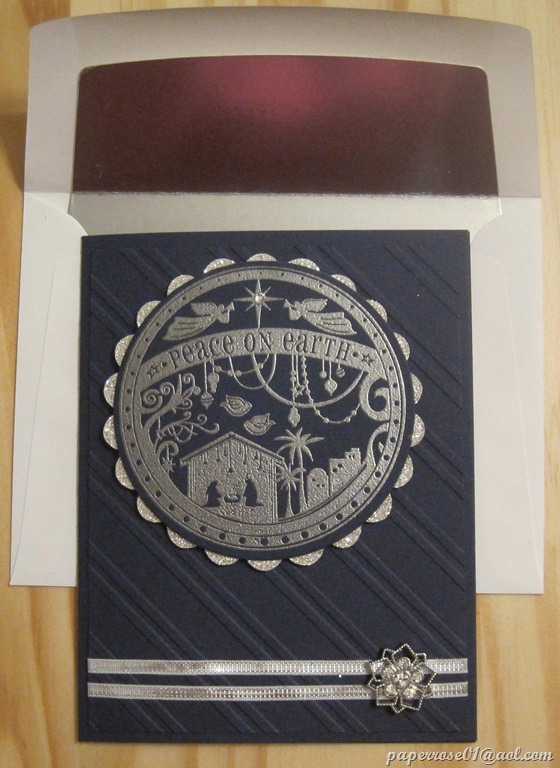 The Christmas Star was embossed in silver, trimmed, and adhered to a navy card with a navy layer embossed with the new diagonal embossing folder. 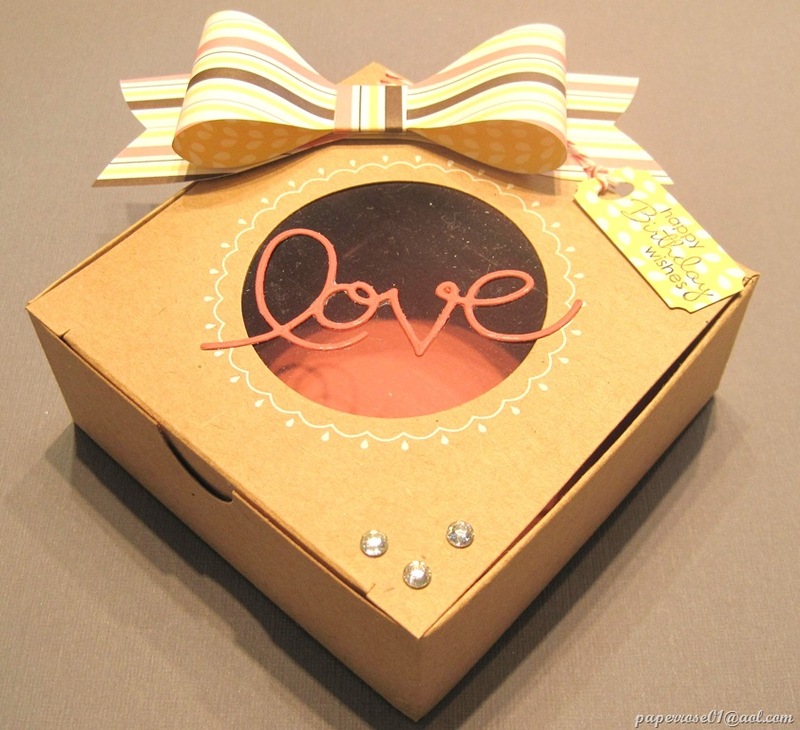 The double1/8” silver ribbon, the simple message layered on a silver scalloped oval, and a single rhinestone finish the card. 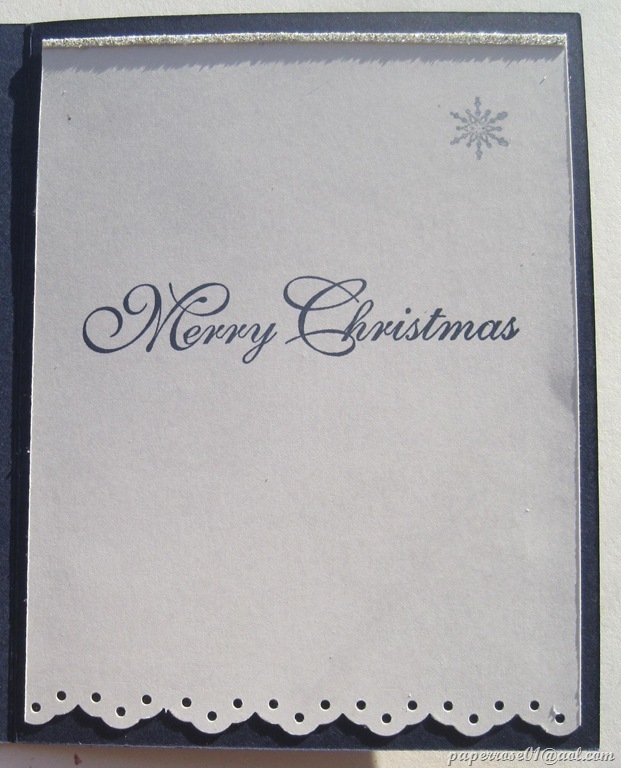 A silver-lined envelope provides the final touch. This is our fifth and final project for our November Stamp Camp. 4 cards and 1 box for $12.00. Dates/times are Thursday, November 14 from 2 to 9 PM, Friday, November 15 from 2 to 9 PM, Saturday, November 16 from 9 AM to 4 PM. Our schedule for December is going to be a bit different as I will be out of town on Saturday December 7th. We will have normal stamp camp on Thursday and Friday, December 5th and 6th. However, Saturday Stampers have an option of November 30 or December 14th. I could also do mornings on December 5th and 6th if that would be helpful. We will be doing only 3 cards and already have them ready to go. They are not difficult but are quite showy. We do not meet in the month of January, but will start back again in February.